As I say “good-bye” to the midwest, I reflect on my favorite swimming places and the people who I have met over the years. On Sunday, I was able to visit Prairie Village Pool, one of the best 50 meter pools for me for the last 30+ years. I saw many of the regulars and some of the most special people in my life on Sunday. It was a good visit. You might think that I am a bit different by discussing pools like I do… but swimmers will understand. I recall when I visited a Olympic Training Center pool. One women in the locker room pulled out her phone with a picture album complete of a variety of pools that she recently visited. Water can be so meditative and centering. Each pool comes with its own personality. My swims have given me strength and helped me to think. It’s my “grounding” time all to myself. One determining factor in my move location was swimming. If there was no pool or “watering hole”, then the location would not be a good fit. 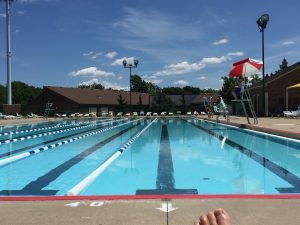 My KC favorite pools include Prairie Village, Jewish Community Center and Roeland Park. All came with their unique qualities and a great set of friends. I will miss them all! Still – Santa Barbara is calling and I am ready to go. Thank you… yes, house is sold and my packed car will leave Friday or Saturday. I hope to see you next during your world travels – please stop by and visit! Sally, I hope the very, Berry best for you. Santa Barbara has some GREAT pools to explore!!! Check out the Casino Club at the Four Seasons!! !